Some years ago a friend visiting the U.S. told me they had food with zero calories. I was skeptical to say the least. Everything has calories except water, right? But, my friend was insistent, these foods did exist. To my amazement, we now have such zero calorie foods here. Well, it's not quite zero calories, but near enough. 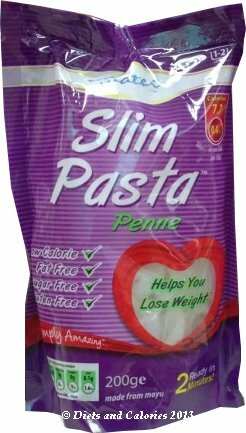 Slim Pasta, Slim Noodles, Slim Spaghetti and Slim Rice are the ultimate dieters friend. They look similar to the real thing but they’re made from a vegetable fibre called Moyu (Konjac), which is commonly eaten in Asia. 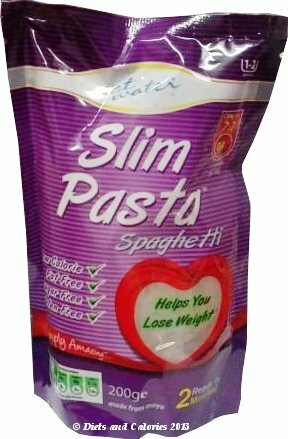 They can help you lose weight because they're low calorie, fat free and sugar free. Plus they're suitable for coeliacs (celiacs), diabetics and those with a gluten intolerance. The noodles, pasta and rice are already cooked. However, they’re packed in a food grade calcium hydroxide water, which gives them a rather unpleasant fishy smell. But as long as you rinse them at least three times in hot water, the smell disappears, leaving the noodles, rice, pasta ready to add to your dish. 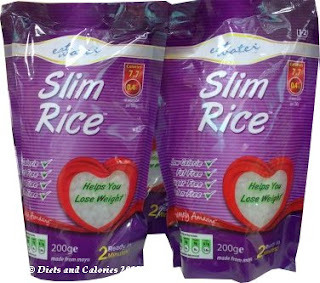 Each 200g pack has contains 15 calories which is enough for 1 or 2 servings. They’re all made out of exactly the same ingredients and they look identical to each other in colour. The only difference appears to be their shape. 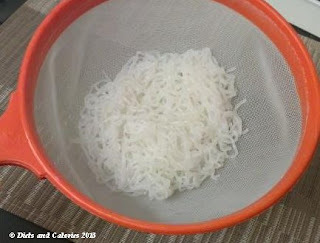 The Pasta comes in two shapes – Penne and Fettuccine, while the rice looks like regular short grain white rice and the noodles look like rice noodles and the Spaghetti, still white but thicker than rice noodles. Needless to say, they all taste the same when eaten on their own. But obviously you don’t do that because they’re pretty tasteless without the addition of lovely spices and other flavouring ingredients. When it comes to losing weight, you can save yourself hundreds of calories, especially if rice, pasta or noodles form a large part of your diet. For example, a 75g serving of cooked pasta provides around 275 calories compared with 75g of Slim Pasta for 6 calories. 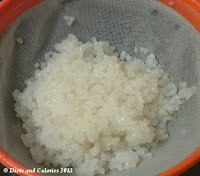 Once you've rinsed and drained them, they're ready to add to your favourite dishes. 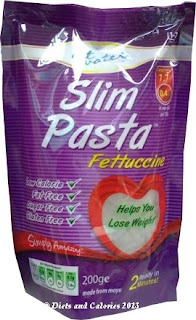 For example, add rice noodles to a stir fry, penne or fettuccine to a pasta sauce, or any of them bulk up a soup. Just make sure you've got lots of strong flavours which will be absorbed by the pasta. I like eating these super low calorie foods when I'm on fasting days of the 5:2 diet. The photo below shows half a packet of Slim Noodles added to Miso soup, together with a handful of baby spinach, some sweet chilli sauce and coriander. This entire bowlful came to the grand total of 25 calories. 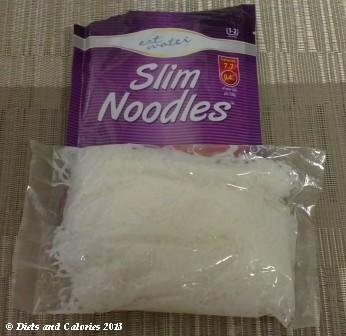 Even half a pack of Slim Noodles is filling and it keeps me full for at least 2 hours. 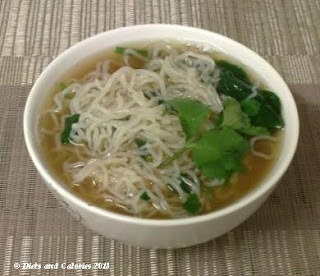 As mentioned earlier, the noodles don't have any taste themselves, but serve as the carbohydrate portion of the meal. However, don't expect them to have the same or even a similar texture to real noodles because they're not made from wheat or rice. They're basically the same as Zero Noodles, which to me, have a texture of crunchy rubber bands! 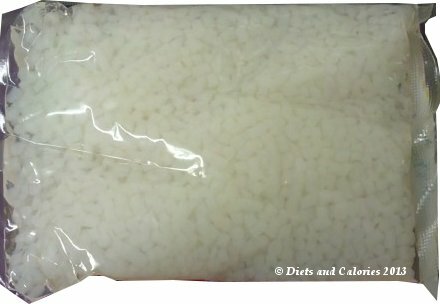 Below are some photos of the Slim Rice. 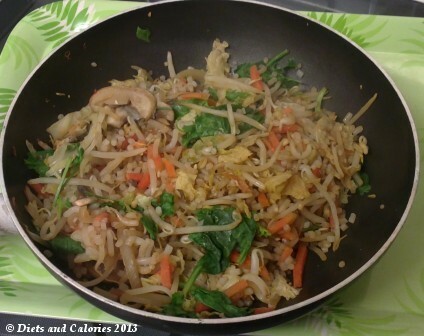 I used these as an addition to make a delicious vegetable stir fry. I added some garlic and ginger, sweet chilli sauce and soy sauce to 400g of mixed vegetable stir fry and used the whole pack of slim rice. The slim rice has the same crunchy texture as the noodles and pasta. In rice form, it also reminded me of tapioca and the grains are very short. 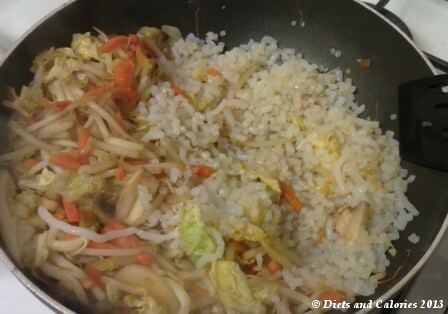 When it was all mixed up with the stir fry, I could barely tell it was there. But believe me, this made the most unbelievably filling meal and took me ages to get through. All this for around 150 calories! 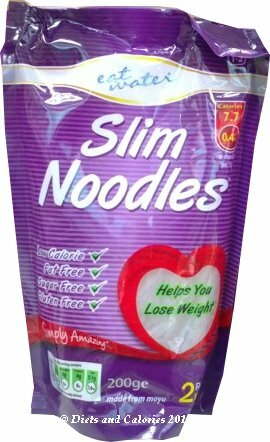 Slim Noodles, Rice and Pasta don’t have to be kept it the fridge so you can stock a supply in the cupboard for quite a while as they have a shelf life of nearly 2 years. You can buy them in branches of Holland & Barrett as well as online and from Amazon. Nutrition Information per 100g (Slim Pasta, Rice or Noodles): 7.7 calories, 0g protein, 0g carbohydrates, 0g sugar, 0.2g fat, 0g saturates, 2.7g fibre, 0.1g sodium. See also: Zero Noodles Related Websites: Eat Water website Holland & Barrett website.